This will be an abbreviated recap, but look for a season wrap-up post sometime this weekend. The loss was the first time Clearfield had been shutout since a 61-0 loss in the state playoffs to Perry in 2002. The Bison had scored in 142 consecutive games since that loss. Clearfield’s 34 yards rushing was the fewest the team had in a game since the 2007 District 9 championship game, a 30-14 loss to St. Marys. In that game, the Bison rushed 25 times for just 18 yards. The 50 total yards gained by the Bison are the fewest by the program since the 1987 team gained just 22 total yards in a 28-0 loss to Punxsutawney. Despite the loss, the 2014 season saw a number of impressive statistical performances, especially by the Clearfield defense. It surrendered fewer than 18 points per game for the fifth consecutive year and held opponents to 89.9 yards rushing per game. Three opponents failed to reach 100 total yards and six converted fewer than 10 first downs. The Bison also recorded 36.5 sacks and picked off 11 passes. Offensively, Clearfield ran for 2,733 yards and threw for another 1,101, giving the team an average of 319.5 total yards per game. The Bison averaged 32.5 points per game by running for 38 touchdowns and throwing for 14 more. The team averaged 5.48 yards on its exactly 700 plays in 2014. Somerset now moves on to face District 4 champion Selinsgrove. The winner of that game will take on the winner of Bethlehem Catholic and Crestwood for the right to move into the Eastern Final. The next step in Clearfield’s 19th consecutive year with a playoff appearance is 10-1 Somerset, the same team the Bison faced in the District 5/6/8/9 Subregional championship last season. Clearfield won a 21-6 slugfest in Hollidaysburg and lived to play for another two weeks and hopes to get past the Eagles again this year. Somerset has overpowered its opponents all year, winning by an average score of 43-11 each week. The Eagles’ only loss came to state-ranked Bishop Guilfoyle by a score of 27-3 in Week 10. Clearfield and Somerset have gone 2-0 against their two common opponents in Punxsutawney and Johnstown. The Bison took down the Chucks and Trojans by an average margin of 21 points per game, while the Eagles won by an average of 38 points per game. Last year’s game was the first-ever meeting between the two schools, but given Somerset’s recent rise to a local power and Clearfield’s consistently winning program, there may be more match-ups between the two in the near future. Both teams start a fairly large number of underclassmen, meaning that Clearfield and Somerset may become familiar with one another in the playoffs in the next few years. Per D9Sports.com, Clearfield starts 5 seniors on both offense and defense, while Somerset starts 4 on offense and 6 on defense. That means that 55% of the starters on the field in Richland Friday night will be underclassmen. Friday will be Clearfield’s first time playing in Richland and will be the first game the Bison have played in Cambria County since winning 12-6 at Cambria Heights in 1977. For the second year in a row, the Bison have three players with at least 500 yards rushing. Last year, Christian Lezzer (1,957), Tyler Stratton (1,319) and Seth Caldwell (800) all passed the mark, while this year Erik Sellers (1,071), Caldwell (964) and Corey Shimmel (506) have done so. Sellers has 1,160 career rushing yards, putting him 56 yards behind Doug Wagner (1976-1978), 58 yards behind Ken Carlson (1959-1961) and 90 yards behind Curtis Frye (2008-2011) on the school’s all-time list. Sellers’ 23 rushing touchdowns this season put him 6th on the school’s single-season list. Caldwell is 36 yards shy of 1,000 rushing yards for the season. He has 1,764 career yards on the ground. Cody Spaid needs just 10 yards passing to go over 1,000 for the season. Senior Nick Kovalick has 219 career tackles, putting him 4 behind Matt Meckey (1998-2001) for second in school history. Seth Ford (2011-2013) is Clearfield’s leader with 253. Dustin Maines had another sack against Johnstown last week, raising his school record for sacks in one season to 14. Friday’s win over Johnstown was Clearfield’s 550th win since 1913, the first full season of Bison football. In its history, the Bison football program has a record of 550-452-35, good for a winning percentage of .547 over the course of 1,037 games. Head coach Tim Janocko is 238-100-3 (.702) in his 30th year with the program. Clearfield is 23-22 all-time in playoff games. The Bison are 10 points away from the school’s 8th 400+ point season. Friday’s game will be a showdown between Somerset’s running game, which averages 253.1 yards per game, and Clearfield’s rush defense. The Bison have allowed just 77.9 rushing yards per game and in the last 5 games, opponents have rushed 122 times for 182 yards (an average of 1.5 yards per carry) and 3 touchdowns. As it does in many playoff games, Friday’s contest may come down to ball control. This season, Clearfield has run an average of 12.1 plays per game more than its opponents. Teams have averaged just 34.9 plays per game against the Bison in 2014. The winner of Friday’s game will take on the District 4 champion next week. Undefeated Jersey Shore faces Selinsgrove for the District 4 title. A full PIAA class AAA bracket can be found here. Clearfield is now 4-2 all-time versus Johnstown, with all four wins coming in playoff games since 2010. The Bison now have an all-time playoff record of 23-22. Friday night’s win pushed Clearfield’s playoff winning percentage to .511. Clearfield now sits at 9-2 for the 2014 season after winning its 8th straight game. This is the sixth time in the past seven years that the Bison have won at least 9 games. Since 2008, Clearfield is 74-14 (.841) overall. Johnstown scored the first points of Friday’s game, but Clearfield stormed back to take a 42-7 halftime lead. Over the past four games, the Bison have outscored their opponents 139-14 in the first half, an average of 34.8-3.5 per game. Clearfield now has 390 points scored this season, putting them just 10 away from the program’s 8th 400-point season. Last year’s team set the record for points in a season with 535. On a per-game basis, the 2014 team’s 35.5 points-per-game would rank 6th in Clearfield history. This year’s team also crossed the 500 rushing attempt mark for the fifth straight season and now has 518 this year. Friday’s game was Clearfield’s second 60+ rushing attempt game of the season and the program’s fourth in the past two years. After attempting 96 passes during this year’s first five games, the Bison have relied on the running game in recent weeks. Clearfield has attempted just 44 passes over the past six games. The Bison have limited six opponents to fewer than 10 first downs this season, including each of the last four teams Clearfield has faced. Through 11 games, Clearfield has allowed just 857 rushing yards to its opponents, an average of 77.9 per game. Teams are averaging 2.7 yards per carry against the Bison this year, half of Clearfield’s 5.2 yards per carry average on offense. Johnstown threw three interceptions Friday night and became the first team Clearfield has picked off three times since doing so in back-to-back games last year against Johnstown and Somerset. Clearfield’s season continues Friday night in the District 5/6/8/9 Subregional final against top-seeded Somerset (10-1). The Bison knocked off Somerset in the same game last year, 21-6. The game will be played at Richland High School, located just outside of Johnstown. The Bison have never played a game in Richland and have only played Somerset once, which was last year’s meeting. The winner of Friday’s game will move on to face the winner of the District 4 championship between Selinsgrove and undefeated Jersey Shore. An updated PIAA class AAA bracket can be found here. A PDF of the AAA statewide bracket can be found here courtesy of Eastern PA Football. The arrangement of the bracket has not changed from last year, meaning that the eventual winner of the District 5/6/8/9 Subregional will go on to face the District 4 champion. Friday will mark the 6th meeting between Clearfield and Johnstown. The Trojans won 6-3 in 1919 and 17-0 in 1924, but the Bison lead the all-time series 3-2 thanks to playoff victories in 2010, 2011, and 2013. Clearfield has scored at least 20 points in 53 of its past 55 games dating back to the end of the 2010 season. The Bison are one win away from their 6th 9+ win season in the past seven years. Clearfield has won at least 7 games in 17 of the past 18 seasons. With a win on Friday, Clearfield would raise its all-time playoff record above .500. The Bison are currently 22-22 in the playoffs. Nick Kovalick is 9 tackles from tying Matt Meckey (1998-2001) for second on the career list with 223. Erik Sellers is 110 rushing yards from passing Doug Wagner (1976-1978) for 23rd on the career list. With 112 yards on Friday, Sellers would pass Ken Carlson (1959-1961) for 22nd. Sellers enters the game with 1,107 career rushing yards. Sophomore Seth Caldwell is 99 yards from his first 1,000 yard rushing season. With 100 yards Friday, he would pass Meckey, Gage Short (1991-1993), and Dave Spingola (1978-1980) for 14th place on the career rushing list. Junior Cody Spaid is 39 yards from giving Clearfield its 26th 1,000 yard passing season. Be sure to check out additional pregame coverage from The Progress, D9 Sports, the D6 Sports Network, and Western PA Football. Clearfield’s victory secured the program’s 5th straight District 9 championship and 6th in the last seven years. The Bison are the only D9 team to win a class AAA championship this decade and have won those five games by an average score of 37.8 to 7.2. Clearfield hasn’t allowed an opponent in the D9 game to score more than 8 points since a 26-14 win over Punxsutawney in 2010. Saturday’s win also broke a series tie with the Chucks. Clearfield now leads Punxsutawney 44-43-3 all-time. 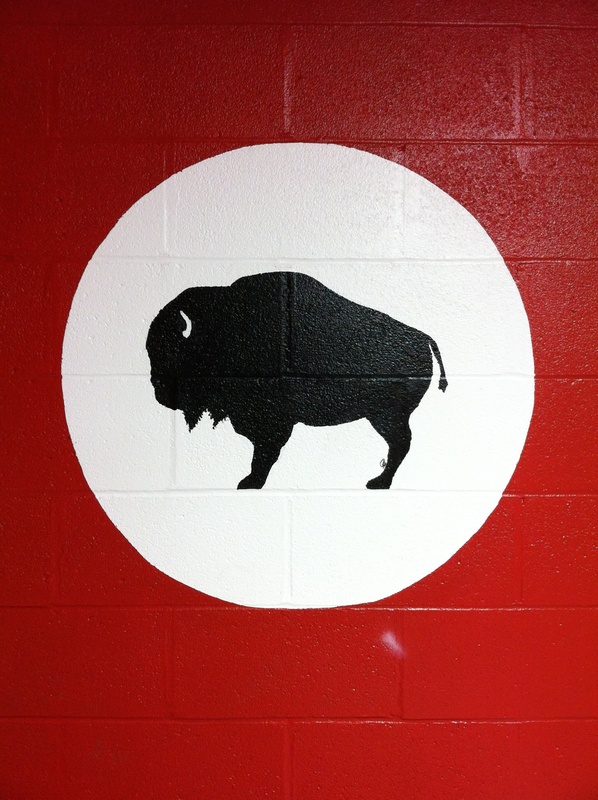 The Bison now have a .500 record over the course of the 44 playoff games the school has played in its history. Clearfield’s all-time playoff record now stands at 22-22. Dustin Maines had three sacks versus Punxsutawney, giving him the school record for sacks in a season. Maines has 13 this year, surpassing Christian Lezzer’s total of 12.5 in 2012. Maines now has 14.5 career sacks, putting him 7th on the school’s career list. Clearfield senior Erik Sellers broke the 1,000 yard barrier versus the Chucks, marking the 31st time in school history that a Bison has done so. Sellers now has 1,018 yards and 20 rushing touchdowns this season. With his two touchdown receptions on Saturday, Ryan Lezzer now has 12 touchdown catches in his career, putting him tied for 11th in school history with Todd Shaw (1999-2002). This season, Lezzer has 29 catches for 585 yards and 9 touchdowns. The 9 touchdown catches this season tie Lezzer for 8th in school history with Trey Campman (2009). Junior quarterback Cody Spaid now has 961 yards passing in 2014, leaving him 39 yards shy of giving Clearfield its 26th 1,000 yard passing season ever. Seth Caldwell is 99 yards shy of his first career 1,000 yard season. Should he reach that mark, the Bison would have a 1,000 yard rushing tandem for the fourth time in the past seven seasons. Caldwell currently stands at 1,701 career rushing yards. The Bison have scored at least 26 points in each game this year and are averaging 34.8 points per game. That average would rank 7th in school history if the season ended today. In terms of total points, Clearfield’s 348 points ranks 11th on the all-time list and is 12 points from passing 2003’s total for 10th place. Through 10 games this season, the Bison have allowed just 818 rushing yards on an average of 2.76 yards per carry. On a per-game basis, the 2014 team currently has the third best rush defense of any team since 1937. Its 81.8 rushing yards allowed per game trails only the 1952 team (74.2) and 2004 team (79.7) in school history. The Bison get one more home game in 2014 as they will host Johnstown in the District 5/6/8/9 Subregional semifinals on Friday evening. The winner will go on to face the winner of top-seeded Somerset and fourth-seeded Punxsutawney.